Both with 7 - Ryan Newman and Dale Earnhardt Jr. It's no secret that this new Sprint Cup rules package with less downforce and horsepower doesn't have a lot of fans. Some drivers are having a hard time adjusting to the car and fans are seeing less passing than in the past. For fantasy players, the new car makes the 2014 statistics relatively meaningless. For that reason I am reviewing the 2013 stats for my picks. The Likely Suspects: The Tricky Triangle has been mastered by a small elite of drivers, including: Jimmie Johnson, Dale Earnhardt Jr., Kurt Busch, Ryan Newman, Jeff Gordon and Kyle Busch. Don't pass these two drivers by, as they may surprise you this week: Kyle Larson and Jamie McMurray. My 2 Cents: My no-brainer pick this week is a two-way tie between Jimmie Johnson and Dale Earnhardt Jr. My next picks are: Greg Biffle, Kurt Busch, Kyle Larson and Jamie McMurray. I will complete my team with Justin Allgaier and David Ragan. My final four: Dale Earnhardt Jr., Kurt Busch, Greg Biffle and David Ragan. Hendrick Motorsports has the most wins at Pocono in the NASCAR Sprint Cup Series with 17: Jeff Gordon (six), Tim Richmond (three), Jimmie Johnson (three), Dale Earnhardt Jr. (two), Kasey Kahne (one), Geoff Bodine (one) and Terry Labonte (one) – including the last four consecutively. Eight different manufacturers have won in the NSCS at Pocono, led by Chevrolet with 30 victories, followed by Ford with 21 and Toyota with three. Of the 74 NASCAR Sprint Cup Series races at Pocono, 15 (20.2%) have been won from the pole; the most recent was Jimmie Johnson in June 2013. About a third of the Cup Series races at Pocono (24 out of 74) have been won from the front row: 15 from the pole and nine from second-place. 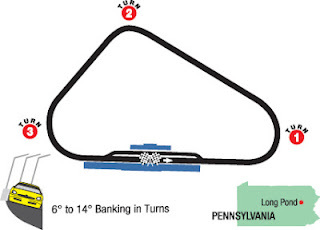 Almost three-quarters of the Sprint Cup races at Pocono, 52 of 74, have been won from a top-10 starting position.